It’s important that driver’s hours are monitored for health and safety purposes, and that a driver keeps their passengers and load secure. This guide covers all the knowledge you will need in your Highway Code theory test. If a driver is convicted of obstructing an enforcement officer during the course of their duties the maximum fine they may receive under EC driver’s hours regulations is unlimited. Drivers who break EC tachograph regulations may lose their licence and be heavily fined. Rest periods are governed by rules and the rules to apply depends on where your journey goes from and to. A driver’s daily rest period may be taken in a parked vehicle if it’s fitted with a bunk. Some vehicles are fitted with sleeping accommodation for the driver. If your vehicle is fitted with this facility you’re permitted to take your daily rest period there, provided your vehicle is stationary. If you have a co-driver you can count any period where your co-driver is driving as a break period as long as you are not doing work. Any break must be a minimum of 15 minutes otherwise it doesn’t count. A seven-day driver’s week is defined as a period from 0.00 hours on Monday to 24.00 hours the following Sunday. If, during your break, your vehicle will be moved by another person you will need to remove the chart and make a manual record of the break period on the reverse of the tachograph chart. Heavy vehicles parked on the side of the road at night must keep their sidelights on. The maximum period of time you can drive without a break is 4.5 hours under EC rules. After that you must have a break of at least 45 minutes which can be split into a break of at least 15 minutes followed by a break of at least 30 minutes. The maximum period you can drive in any one day is nine hours, extended to ten hours on two days of the week. The maximum driving time allowed in any two consecutive weeks is 90 hours. They don’t have to be split evenly, but the maximum time you can drive in one week is 56 hours. I.e. if you’ve driven a total of 56 hours in any one week you can only drive for 34 hours in the following week. If your hours add up to a total of 56 in any one week you must make sure that you don’t exceed the permitted hours the following week. Keep your own record to make sure that you don’t exceed these hours. The normal weekly rest that must be taken is at least 45 consecutive hours. This can be taken by extending the daily rest period. A driver may reduce his daily rest period to no less than 9 continuous hours, but this can be done no more than three times between any two weekly rest periods. The usual minimum daily rest period is 11 hours. Under EU rules a driver must take a 45-minute break every 4.5 hours of driving. This can be split into a two separate break periods of 15 minutes and 30 minutes. Domestic rules apply to certain journeys within Great Britain that are not subject to EC rules. Under domestic rules you must keep a written record of hours worked when driving goods vehicles. Before you start your journey you should record the place from which you’ll start your day’s journey in the centre of the tachograph. Your employer will provide tachograph charts to you. This tachograph symbol is the mode for driving. Some tachographs don’t have a ‘driving’ mode switch. These tachographs will automatically record driving time whenever the vehicle is moved, whatever mode the switch is set to. This tachograph symbol is the mode for rest. A tachograph records driving time, rest periods and vehicle speed for one 24-hour period. The ‘mode’ switch on a tachograph changes the mode between recording driving, other work and resting periods. If it stops working, you can continue driving and make a manual note of hours worked and distances travelled. If you have to exceed the maximum number of allowable hours driving, under EC rules you should continue with the same tachograph and write an explanation. The reason could be because of an emergency or unforeseeable hold-up. As long as road safety is not put at risk you may depart from driver’s hours rules just enough to ensure the safety of passengers, your vehicle, or its load. If you change to another vehicle with the same type of tachograph during your work day, take the tachograph chart with you to use in the other vehicle. If it’s not the same, use a different tachograph chart and ensure all the information is recorded on it.Tachograph records must be made available for inspection by an enforcement officer. If the officer keeps one of your charts the office must sign the back of your replacement chart with their name, telephone number and the number of charts retained. Always carry more clean, undamaged blank charts than you need to use – you will need one for every 24 hours. If you lose your tachograph or it is stolen you need to tell DVSA; if you damage your tachograph chart, continue with a spare one. If the tachograph on your vehicle becomes faulty you should take it to an approved tachograph repairer as soon as possible. If your vehicle can’t return to your base within a week of discovery of the fault, the repair must be carried out while you’re away on the journey. While the tachograph is faulty or broken you must keep a manual record of your activities. Analogue tachographs must be checked every two years by an approved calibration centre and recalibrated and sealed every six years. You can find out when your tachographer was last recalibrated by looking at the plaque on or near the tachograph. You must never alter your tachograph record. The operator will have a company card. If you lose your smart card you must inform the relevant authority within 7 days. 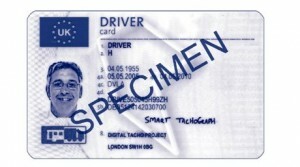 Your digital tachograph driver smart card is valid for a maximum of 5 years. You should receive a reminder about three months before the expiry date. However it is your responsibility to make sure that you apply for a new card at least 15 days before the old one expires. A tachograph is fitted to lorries of more than 3.5 tonnes. If you drive such a vehicle you need to be familiar with how the tachograph works and the regulations that govern its use. Goods vehicle drivers’ hours are controlled in the interests of road safety, vehicle security and fair competition. Those found breaking the rules are likely to lose their licence and face heavy fines. EC regulations set the maximum driving times. Bus operators must use a tachograph for regular journeys above 50km. Bus drivers must take a break of at least 45 minutes after driving for the maximum period. Always park your vehicle in a safe place off the road. Try to find somewhere you can get out of your vehicle for refreshment. This will help to ensure that you’re fully refreshed. If you’re carrying passengers, they’ll also be grateful for a break. Taking breaks at the correct time will ensure that your passengers are safe and comfortable. If you are driving a bus with 18 seats or more travelling between England and Scotland on an excursion journey you must abide by EC rules. If you are asked to leave your bus by an official who is not in uniform you must ask to see a warrant card. The official is likely to be an enforcement or police officer, but don’t presume this: it could be a criminal imposter. For vehicles where there are two or more drivers, each driver has their own tachograph. Y our tachograph chart is your personal work record and, as such, should reflect the hours that you drive or carry out other work. The law requires these charts to be held on file by your employer for a period of at least one year. Enforcement officers can require charts to be handed over for inspection. When leaving a lorry with a load it should be left in a place which is well-lit and legal, and preferably secure. Maybe allocated lorry parks are patrolled by security firms or the police to minimise crime. It’s the driver’s responsibility to ensure that the load gets to its destination in the same condition as it was loaded. Leaving the trailer in a lay-by is not recommended. You can leave your lights off at night when parked if you are in an off-road parking area, but you must have your sidelights on if you are parked on the road. You can reduce the chance of it being stolen by fitting an alarm to the cab and a kingpin lock or drawbar lock to the trailer. Many thieves are opportunistic and if you make it hard for them, they will move to another target. Park the rear doors up against another vehicle or wall so that they can’t be opened. To reduce the risk of theft you should avoid giving lifts to strangers and discussing your load with the general public. If you are sleeping overnight in your cab, make sure doors are locked, windows are secure and your trailer is parked up against something that makes it impossible to open the rear doors. Always lock your vehicle when you are not in the cab, for example when you are making a delivery or doing an inspection of the trailer. More than 3000 lorries with an insured value of over £30m were stolen in the UK in one year. Carriers of high value goods such as cigarettes and alcohol should vary their routes, park overnight in well-lit, secure areas, and remove keys from the vehicle when it’s unattended (this includes even if you are doing an inspection). You can talk to your local crime prevention officer for other tips. With fuel prices increasing, also be on the lookout for people trying to steal diesel from your tanks. As around 3000 trucks are stolen each year, having roof markings can help police track your vehicle from the air. Fleet operators, particularly those who regularly carry vulnerable/dangerous loads, are encouraged to use roof markings. You can also install GPS tracking systems so that the truck’s location can be seen at all times by an authorised person.